The Vaunn Chrome Frame is our pick for the best pedal exerciser, which requires no tools for setup, so it can be easily to use right away. It can also work for the arms and its strong frame construction ensures stability all the way. Our step-up pick is the Vive Portable Medical and it can be used both for fitness and for medical purposes. It can also work for office desk exercises and has a compact design of only 12 1/2 inches in its height, easy for hiding. The budget pick is the DMI Lightweight Mini and this one has a silver finish so it looks good and won’t easily rust. It can be great for leg toning and can also be used for the arms. It has a resistance knob so you can also intensify your workout. 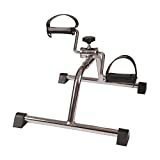 A pedal exercising machine is a kind of machine that makes the same use and mechanism as a stationary bike would. The pedals are set on a different level as a bike machine would, and they all vary in designs and in functionality. However, most of them have the purpose and goal of making you fit and sweat a lot due to its good amount of workout capabilities as an exercise machine. Exercising at the gym or at home is important to keep you fit and healthy. This is because when you don’t exercise, you are going to lose some years off your lifespan. This is when you get heart problems, bone problems, diabetic tendencies, respiratory problems and many other sicknesses and illnesses that can form when you don’t exercise properly and regularly, or at least do any physical activities so that you will still burn some fat and calories. People who are doing a desk job are often the target of such health problems if they do not exercise properly and regularly. Sitting all day can take some years off your lifespan and will also make it hard for you to do workouts later on. 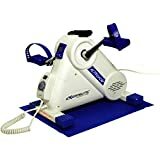 If you have the job of sitting all day in a desk and you have no time for workouts, you can definitely try an under the desk exercise machine to help burn fat/calories. A big benefit of pedaling exercises is that it can help with leg strength. While you are still sitting on the desk, if you have a desk job, this is a great exercise that can help you to stay healthy so that you do not feel fatigue too often. These kinds of leg exercises can be ideal for those who do not have enough time to go to the gym due to their hectic schedule. Pedaling machines are a great way to bike even when it is cold, snowy or rainy outdoors. It can also be used by very busy people, such as those who are working in an office and meeting deadlines often. If you don’t have time to go to the gym either because you are working or because the weather outside does not permit you to ride on your bike, the exercise machine can be a great alternative for you. Like all exercise machines, you need to consider tuning up the biking machine before you use it. Some of its parts can get corrosion and this is why you need to take care of it properly when it does get gritty to use later on. These parts that are mostly made of cheap aluminum or steel, can be greatly corrosive if they are not taken care of properly. Plastic parts should also be durable so that they won’t crack easily. Some of these machines are meant for medical purposes, such as for knee and leg therapy, while others are for fitness purposes. Leg therapy is ideal for those who have gone through surgery and injuries, as well as the seniors who don’t have a lot of physical power to do exercise outdoors or on a gym, and want to stay fit while at home or in a hospital. This is where the exercise machine for legs will come in handy. Intended usage: they can either be for medical purposes or for fitness purposes. For medical purposes, it can be used for those who have gone through traumatic injuries, gone through surgeries, or for people and seniors who are not very good with their legs and need to help themselves stay fit without causing too much stress for their legs. For fitness purposes, it can help increase your leg strength and can also burn a lot of calories and fat. Assembly: some of these machines already come pre-assembled, while some need to be put together. The assembly of this kind of exercise machine for the legs can be complicated, so it can be best to go for one that already comes pre-assembled so that you don’t have to do anything. It is important that the exercise machine for the legs is user-friendly when it comes down to operation and instructions so that nothing will go wrong. Other body parts: some of these leg exercising machines can also be used for your arms. There are some specially designed exercise machine for the legs that can be versatile in this case. Check the user’s manual of the exercise machine for the legs so that it will be easy for you to determine which parts of your body you can use the machine for as well. Durability of the parts: the frame, pedals and other parts of the machine should be durable. The metal parts, such as the tubes and the stepping mechanisms of the exercise machine for the legs, should not easily corrode and should have a good finish or coating. The plastic parts of the exercise machine for the legs should be durable as well and should not easily crack over the course of time. Portability: most of these machines can be portable so that you can take them with you anywhere. It pays to have an exercise machine for the legs that is portable because you can use it to work out while you are traveling, or if you are moving over to another house or staying at a friend’s house. If it is permitted, you can even take the exercise machine for the legs to your office or company rec room. Stability: you also have to consider one that is stable and will not move from one place to another to avoid unwanted accidents while you are using it to exercise your legs. While it is true that you need to sit somewhere in order to make the exercise machine for the legs work, so it does not put stress on the actual machine, it should still be stable so that it won’t cause injury later on. Electronic display: some of the more expensive units out there do have an electronic display, which can be helpful if you want to track your progress each day and in each workout session for you to get more motivated than ever before. This is important because most people get tired easily if they don’t know how much they have pedaled in their exercise machine for the legs, so it can act as a motivating device, and you can share it. Warranty policies: you also have to consider if the manufacturer will be kind enough to accept warranties, since it is a machine that has moving parts and can also malfunction when the parts are not solidly made. You should ask about the warranty period and any policy for returns, if possible. As our top pick, the Vaunn Chrome Frame has goods stability due to the strong chrome frame construction. In addition to that, the adjustable tension makes it easy for you to adjust your workout plan and its difficulty. The rubber feet add stability on the ground so that it will not easily get out of place while you are doing your workout. There are 3 layers of chrome metal that are corrosion resistant with steel layering as well. You can also use it for exercising your arms other than your legs so it is a versatile kind of machine to use. It can give you benefits such as better blood circulation and it can also be useful for muscle toning. The impact of this machine is not too high so it is also a good recovery exercise machine. It stands 14 inches high so it is not too obtrusive in the office or at home. The only con but not a deal breaker with the Vaunn Chrome Frame is that it might not be as realistic as a real bike, but it can definitely help with your leg exercise routine, nonetheless, and this is true for most pedal exercisers out there, anyway. The Vive Portable Medical is our step-up pick, which only has a height of 12 1/2 inches so it can fit comfortably under most desks. The non skid and non slip feet ensure that you can exercise without worries of ruining your home or office floor and losing stability. You can also feel much more comfortable with the customizable and adjustable toe loops on the machine. The fact that this machine has molded finger grips can also work for arm exercises. You won’t have to worry about disturbing others when you are working out because of its smooth pedal operation. If you find that you often get distracted while at work or at the gym, this kind of machine helps you get greater focus and concentration. The intuitive LCD screen display can give you the stats you need, such as distance and calories burned, RPM, speed, total time and the like. It is an ideal machine for a low impact exercise. For our budget pick, we chose the DMI Lightweight Mini, which can also be used to exercise your arms other than your legs. It can be used while you are sitting right on the comfort of your own chair at home or in the office. If you want a portable machine that can help you to improve stamina, this is a good choice. If you find that you have limited range of motion, you can use this for recovery. You can also expect easy storage and traveling purposes with this machine due to the ease of disassembly when no longer in use. If you want a machine for strengthening muscles for your arms and legs, this is a good choice to have. It can also be used by the elderly and those who are often using wheelchairs to move around, so that they can stay fit despite being limited in their range of motion. The Homgrace Mini Bike is a great choice if you want something that has an LCD screen so that you can easily find out your stats, such as your total number of steps, calories burned, time spent and the like. The design of the parts won't hurt your ankle so it will be very safe to use and not awkward to ride on. It can definitely save time and space due to the portability and the slim design. This kind of machine also works as an arm exerciser, alternatively. Even if you do have large-sized feet, this machine can take care of it without being too uncomfortable. It also comes with an instructional manual so that it can be easily assembled or disassembled when some of the parts break down. It is an ideal machine that can be used for work or home routines, and it only stands at 12 inches in height as a low profile machine. If you want a truly portable item for exercising at home or in your office, the CanDo 01-8030 is a good choice. It has low profile height of only 10 inches and it is super lightweight at only 10 lbs, but not very hard to move around yet stable when in place. It also has an LCD screen for your workout information so you can get yourself motivated while doing your workouts. Whether you are at home or at the office, you can find it very useful and stable without compromising your safety and comfort due to the ergonomic hand grips. Because of the fact that the is not motorized, you can train your legs and arms to have better grip strength. The unique thing about this machine is that it has bi-directional pedal rotation so you can also do some reverse workouts. Only 2 AA batteries are required to run it. For home use, you can depend on the Exerpeutic 7101 Active, which can be used in front of the TV or while doing other things at home such as using your phone while sitting. It is a machine that strengthens muscles while you can also get your blood pumping properly. The speed motor can be adjusted as needed so that you can customize your workout plan accordingly. It only consumes 6.5 watts of power per usage. One thing about its easy portability is that you get handles that come with the unit so you can carry it anywhere you want. There is a floor mat that comes with the unit so that it does not skid your flooring or go out of place. The display shows your speed, calories burned, time, distance and other information. It works on any standard 120-volt system and has a limited warranty of 1 year. If your area is not that big for an exercise machine, the MedMobile Lightweight Portable is a good choice because of its small height of only 13 inches and small but durable frame. The variable resistance can be adjusted using the included knob that is on the machine. There are also straps that keep the whole item comfortable when you try to ride on it. For those needing a super economic exercise bike, this is a good consideration. To save you time from having to set it up, no assembling is required with this unit. It is very travel-friendly and comes with a function display as well, so you’ll know how much calories you’ve burned, the revolution count, total exercise time, revolutions per minute and other details. It can also work well on your carpet and other flooring types. The design of this workout machine allows you to enhance and practice your mobility and circulation. If you often work in an office then the ideal machine for your needs could be the DeskCycle Desk Exercise. It has a quiet pedal motion so it will not disturb other people in their cubicles and can even make you focus on your work much more than ever. The height of only 10 inches makes this super low profile and very easy to fit into your under desk area. 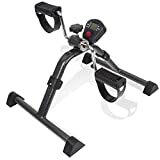 The components of this machine include the patented magnetic resistance that makes it work properly and pose a challenge for getting your legs into a nice workout. There is also a calorie calculator among other things in the function display, which shows burned calories, distance, time, speed and the like. You also have a choice of up to 8 calibrated resistance settings for this machine, and it can also be used while you are reading. It has a 1-year warranty. The Carex Health Brands is a good choice for those who want to work out their arms or legs as a daily routine. It has the option for you to control resistance levels due to the tension control knob that is present in the machine, so that you can adjust the difficulty of the machine when you use it. One thing that can help secure your feet to the mechanism is the presence of the straps. You can also see your total calories burned in the machine’s display, as well as the number of reps, total time spent and the like. If you want a really good progressive exercise program, you might want to try this one. It also has a sleek design and is easy to operate on the floor while you are doing your average desk jobs. It can be used by the elderly as well due to its ease of setup. The Sunny SF-B0418 Magnetic is a machine that uses magnetic technology in order for you to exercise and workout your legs. It has a max user weight recommendation of up to 220 lbs. It can also display various aspects of your workout in the LCD screen, such as time spent, number of calories burned, ODM, distance, speed and many more. Additionally, the micro tension controller can be set for up to 8 levels. For those who want a machine that will cater for easy portability, it has a handle that can be used to carry the machine or exercise item on the go. There are also straps that can work well to secure your feet when you are exercising. What’s more, you can also use it for your arms and hands for a good full body workout. While others looked promising, they lacked in stability when you are using them, hence they were not that safe to handle. Also, most of them can get corrosion quickly so they might not be ideal for long term use. Q: What are the pros of a desk cycle? If you stay active at work then you can exercise, stay fit and also finish your job at the same time. The most important thing about working out while working on your desk job is that you can accomplish two things at the same time, especially if you don’t have a lot of time to go to the gym or do exercise at home. Most people who work on a desk job might find it very hard to lose weight because they are lacking time to do so. However, if you have a bike exercise machine, it can definitely burn some fats or calories and it will result in weight loss hereafter. Many people claim that the bike exercise machine can actually get them more focused on the desk job, and not distracted. It is the same thing as if you were working on a standing desk. You aren’t paying attention to the bike exercise machine because you are just biking it as a minimal movement kind of activity. 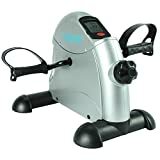 One of the best things to know about the bike exercise machine is that it is very portable and very easy to carry to your desk job site or office. Or, you can also use the bike exercise machine at home and vice versa. 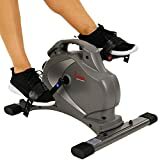 If you use the bike exercise machine more often, you will find that you can also tone your legs and your feet even if you don’t have a lot of time to work out at the gym or at home. Q: Which muscles of your body are being worked out by a bike exercise machine? 1. Lower body (legs) – the bike exercise machine can help your lower body, such as your legs, to gain more strength. It is a good toner for your lower body muscles, so if you are looking forward to “leg day”, the bike exercise machine is a good choice for a workout idea. 2. Upper body (arms) – if you want to work out your upper body as well, such as your arms, the bike exercise machine can also work well for your arms, since it is the same concept. 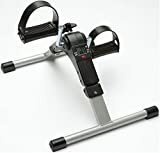 Just place the bike exercise machine onto a table and get ready to bike using your hands and arms for muscle toning. 3. Back – sometimes by using the lower body, you can also get some results for your back muscles because you are sitting in an upright position when you are cycling or spinning. Q: What are the benefits of using bikes? Using a bike can definitely be more economical because it can save you from having to purchase fuel all the time, and can also save you from expensive auto parts. Because you are not riding a smoke belching vehicle, you can contribute to the environment very well and do your part. The most important thing for many people is to be able to breach through traffic in a breeze if they are in a hurry to their job. This is why having a bike as a means of transportation is a preferred method for many people who live in high traffic areas. A great thing to consider about riding a bike is that it can also make a great workout for your body and especially your legs and lower body parts. You also improve your heart health when you keep using your bike more often, as compared to just riding a vehicle or driving. This can help you to live longer as well and endure workouts much better. If you want to improve the endurance of your muscles then you should consider this kind of workout for your indoor routine. Many muscles of your body can definitely be worked while you are indoors with this kind of exercise machine. Because it is a low impact exercise, you will not be working your body too much, because it is not too stressful to your body, and especially to your knees, even if it is working your legs. This is ideal for those with knee problems or injuries. If you want to release endorphins and feel good as if you are playing sports, using an indoor cycle can be a great way to release these feel-good body components. It is a great stress relieving activity, in the long run. Those who often go for an indoor cycling routine can also have a stronger heart and endurance, which can also help you to live longer, especially if you feel that you get tired often in your later years. Q: Are there benefits to using a bike for the arms? 1. You get cardio workout if your legs are badly injured. 2. It still burns a good amount of calories. 3. Arm cycling can be a great cross training option. 4. It helps a lot with core strength. 5. Upper body training is also a great benefit from it. 6. You have the power to add variety to your training. Q: Why should you also stand while you are on your bike? 1. It helps with endurance because you are using a lot more energy. 2. You can also enhance your sense of balance when you are standing. 3. Because you use more energy, it’s also a good calorie burner. 4. It also frees your buttocks from being seated all the time. 5. With that fact, it also frees your buttocks from bumpy hill rides. Q: What are some common problems with bike exercises and how do I resolve them? You have a bike that has a desk attached, in which the seat isn’t comfortable and the desk it too small. a. Consider a separate bike unit. b. Consider a separate desk. The bike exercise machine is too tall for my desk and for my actual height. a. Try lowering your chair. b. Use a desk that has adjustable height. c. Raise your current desk with raisers. Noise is coming from the bike exercise machine and can be a distraction to most people. a. Use graphite powder on knob clamps. b. Add a carpet underneath. c. Add a rubber mat underneath. I don’t have enough budget for under desk bikes. a. Try cheaper ones at $20-$30. b. Ask your local gym for suggestions. The bike machine keeps moving out of place and is not stable. b. Tie it up with a rope or belt. I sweat a lot when I work out on the bike machine and it can look embarrassing. b. Use a lower resistance. Q: If I bike backwards, is it effective as a workout? Q: Which is better: indoor cycling or outdoor cycling? Indoor cycling is actually harder because you are often struggling to get more pressure from the function display, from your gym mates and the heat of the room. Outdoor cycling is a relaxing way of staying fit, so not everyone who bikes can bike as hard as other people can. Indoor cycling is a lot difficult because of the various motivational effects around you. Outdoor cycling is a breeze so it is loved by most people, unless you take on more difficult outdoor challenges. Indoor cycling is super convenient because you can do it anytime. Outdoor cycling can be a hassle if it snows or if it rains in your area often. Q: How much calories can you burn with cycling? Q: How much calories can you burn while indoor cycling? Q: What are some exercises you can do on your desk? 1. Stretch by reaching as high as you can. 2. Exercise your neck by looking around. 3. Do some shoulder raises and hold for a few seconds. 4. Raise your hands as high as you can while sitting. 5. Do a knee press while you are on a desk. Q: What are some low impact workouts that you can do for your legs and knees? 1. Perform a series of single leg squats. 2. Do a reverse lunge and switch feet as you go. 3. You can also try a kettle bell swing, if you have one, or are at the gym. 4. A hamstring curl that has a sliding motion can also keep you fit for 10 reps.
5. A lateral lunge can be done with around 8 reps.
6. Perform a deadlift using just one leg. 7. If you can, doing deadlifts can also be of lower impact. 8. A hip thrust can also be a great workout to consider. Q: Why should children learn how to ride a bike? 1. Biking is a fun activity for children. This is because children can have a very short attention span and are always looking for a fun activity that they will enjoy and won’t feel bored at all with. This is why you can definitely get your child to learn how to ride the bicycle and they will definitely love it. 2. Kids can be more physically active. An important thing to consider when it comes down to children learning bicycle riding is that they become physically active, and this can help them to escape the threat of obesity and other health problems. 3. Children can also learn physically and mentally. If children can learn how to ride a bicycle, they can gain self-confidence and they will also exercise and train their brain on how to be mentally alert all the time. At the same time, they can also learn more physical skills. 4. Family activities can involve biking. Cycling is a great family activity that everyone should experience, and it would be a fun thing if you can go around biking with your kids together. 5. Children can use it to go to school. Instead of riding a school bus, you can also save money by allowing your child to use a bicycle to go to school if it is nearby. In fact, it is a great means of transportation that children can use to go to any place that they want. 6. It does not cause pollution around them. Bicycles are very eco-friendly because they do not emit smoke at all. It will teach your child on how to conserve the planet by using an eco-friendly vehicle or means of transportation to reach their destination. Q: Can seniors benefit from bikes? 1. It will help their cardiovascular system, so they can live longer. 2. Their muscles will also be exercised much more. 3. Endurance of their lungs can also be practiced better. 4. They will keep themselves physically and mentally active. 5. It can be a great way to be sociable even when you’re older. Q: What are the differences between exercise bikes that are recumbent and those that are upright? Bikes are on the front of the body. Bikes are under a person’s body. The seat type is usually larger and more comfortable. The seat type is usually smaller and less comfortable. Recumbent bikes are lesser in impact, so they are good for those with injuries. Upright bikes give more impact, so they can’t be used by those with leg or knee injuries. Q: What are some examples of exercise machines on a local gym? 1. Treadmill – these allow you to run constantly or walk, and can be adjusted on its incline option. 2. Elliptical and stepper – these are kinds of machines that emulate stairs, so you can burn more calories. 3. Indoor bike – this can emulate a regular bike by the force of the bikes. 4. Rowing machine – this can emulate rowing on a boat and can work your arms. Q: Which exercise machines and equipment are recommended for arthritic people? Q: What injuries can I possibly get from indoor cycling? Q: What are some common indoor cycling mistakes that beginners might make? 1. Gripping too much – stay relaxed so that you don’t put too much tension and get tired. 2. Uncomfortable seating – adjust your seating so that it is not too high nor too low. 3. Not coming early to the gym – going early puts you to an advantage to adjusting your bike first. 4. Handlebars are too high – adjust them so that you won’t feel too much fatigue. 5. Your knees almost hit the brake – bike in a way that doesn’t go too much forward. 6. Too much or too little resistance – make sure you have the resistance that you can take. 7. Improper form – bike upright so that your core does not get neglected from the workout. 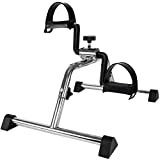 In the long run, we believe that the Vaunn Chrome Frame is our pick for the best pedal exerciser due to the fact that it is versatile enough to act as a leg exercise machine and as a very good arm workout machine as well. It has non skid feet that keep it stable all the time and the frame construction is also excellent.